UMass has a Quidditch team. For those that are uninformed, Quidditch is a sport played by wizards in the Harry Potter book series. In the novels, the game is played on levetated broomsticks hundreds of feet above the ground. The school's team does actually play other colleges in Quidditch matches. It seems to me that there are categorically three separate incarnations of the disinterested. First, there is the kind of person who makes a conscious effort to seem engaged. Even if the conversation is one sided and masturbatory, the disinterested party will fain interest. Another kind of disinterested is the one that will not fain interest but will not prevent a lengthy dialogue. Every once in a while there will be a nod or two but for the most part you will be looking at an individual presenting a 'one-hundred yard' stare. Finally, there is the person that disregards a topic that they find boring right off the bat. This saves time overall, but can also be a little standoffish. Lev bought a macro lens this week. This means that he can take high quality pictures of objects at a very close range. 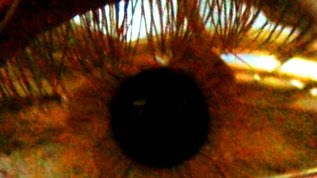 This is a picture of my eye. This sign is above the back seat of every public transport bus on campus. No smoking, no food or drinks, no robots.